Why wild? For us, this question is defining. For us, in seeking out its many possible answers, we find ourselves touching on some of the biggest issues surrounding our environment and food systems today. From supporting local ecosystems and food systems to demanding better handling and harvesting of animals to ensuring good nutrition for ourselves and for our families, wild wins out. Why wild? Or, more specifically, why wild in Hawaii? Hawaii’s isolation makes it the world capital of endemism – meaning, for its size, Hawaii has the highest rate of species that exist nowhere else on Earth. Because the Hawaiian archipelago is so remote, any plants or animals that arrived prior to humans, carried on wind or water, were only successfully established at the rate of one new species every 25,000 to 50,000 years. Hawaiian species evolved and co-evolved over millennia and are now as incredibly unique as they are extraordinarily vulnerable (human-accelerated new alien species colonization now occurs at the rate of once every 18 days). The most pervasive threats to Hawaiian species are non-native and invasive plants and animals. Lacking any large native herbivorous mammals, Hawaiian plants are not adapted to ungulate browsing and trampling. 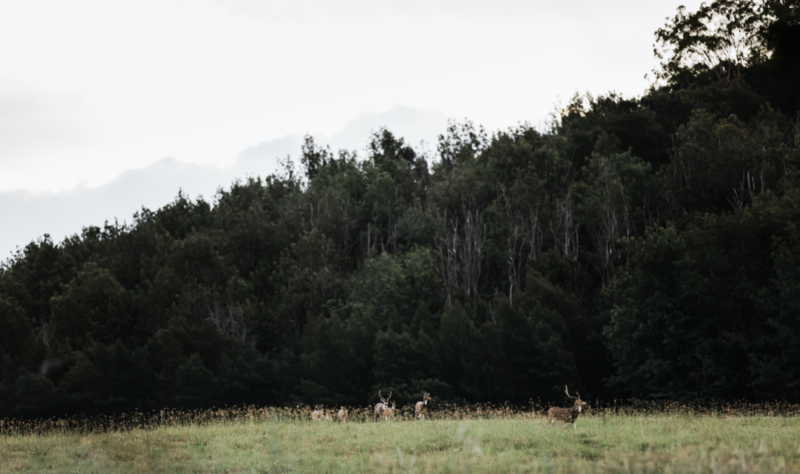 Invasive feral deer, pigs, goats, sheep, and cattle are responsible for widespread destruction of lowland ecosystems and continue to degrade remaining native ecosystems, including critical forested watersheds. 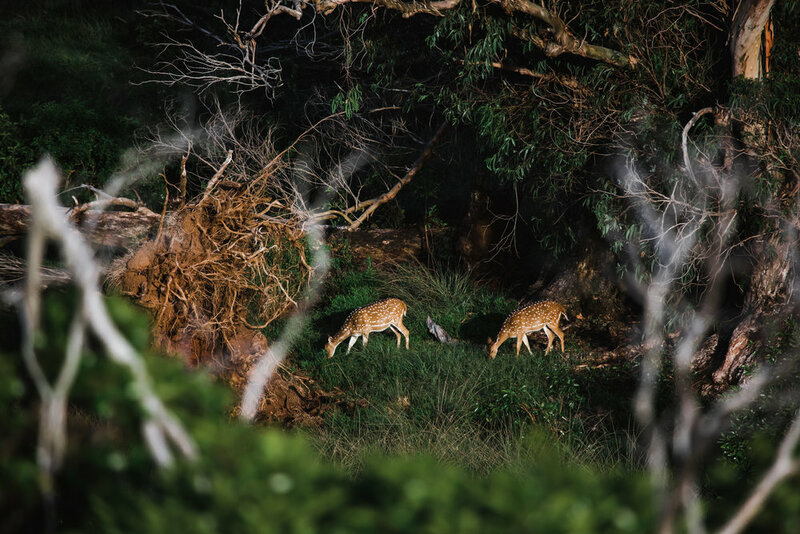 Alongside many of Hawaii’s conservation initiatives, mindful harvesting of Hawaii’s wild deer populations is an important management tool as we continue to work to lessen our impact and the impact of species that we have introduced on and to this beautiful and rarefied place. There is a growing push for better meat – meat that is better for the environment, for the animals themselves, and for our own nutrition. Even for the most conscientious meat-eater, finding the most nutritious meat options in the marketplace can be pretty mystifying. From misleading labeling to a ton of misinformation surrounding the livestock industry, wild harvested meat stands as a simple and sound answer for anyone looking for wholesome and nutritionally dense protein. Hawaii’s Axis deer are an incredible source of protein, one that is comparable to beef (both offering about 21 grams of protein in every 100 grams of meat), while also offering the leanest meat of any deer species in the world let alone any poultry, beef, or pork. Because these deer roam wild, their diet is made up of a wide array of grasses and plants that make the small amount of fat found in venison a great source of Omega 3 fatty acids. Dense in iron and niacin, as well as a good source of Vitamins B12, B6, and riboflavin, venison sourced from wild deer that enjoy such a varied diet, day in and day out, also provide a more complex and complete set of micronutrients. If we subscribe to the old adage that we are what we eat, it also becomes very important to consider what what we eat eats. Are we taking in mono-crops masked as entire meals or are we seeking out foods that source their own meal plans from the greatest nutritionist around – Nature. Wild food systems point us back to our earliest life-ways; in practice, they inform culture and link us to land and sea. While fostering this fundamental connection to our environment, sourcing our food from the wild also drives home the importance of local ecological knowledge and resource management. In Hawaii, many of the species that make up our local and wild food systems are introduced ones, some – like Axis deer – are even highly invasive. Still, with growing concerns over healthy sources of food and local food security, it’s easy to see why Hawaii’s deer are not only a feral problem but also an incredible food resource and in looking at them as such, it becomes vital to harvest these animals mindfully. Mindful harvesting, for us, always starts with great data. All of our venison is sourced from a field operation, the only one of its kind in the world, that actively manages deer populations in Hawaii using FLIR (Forward Looking Infrared) technology in which the heat signatures of animals are detected, recorded and compiled into highly accurate population surveys. This data holds the operation accountable to the service they are providing to land owners and managers as well as to the communities that are impacted by that work. FLIR technology also helps to reduce stress on the animals by allowing all inspection and harvesting to be done entirely at night without the need for any visible light and, more often than not, without deer being aware of the team’s presence – deer are never fenced, penned, corralled, baited or pressured in any way up until the moment they are harvested. In looking at the whole story of our jerky, mindfulness is central. And what better way to approach wild food systems and the connection they provide, the connection they demand that we have to the natural world? What better way to go into the wild than mindfully?